Lemax Elf Made Toy Factory sights & sounds table piece offers a musical and animated masterpiece depicting Santa's wonderful Elf workshop. Lemax Elf Made Toy Factory plays a recorded musical soundtrack, whilst the gears in front revolve, and raw toy materials move in and out of the workshop with the toys inside the clear tube swirling on a turning screw. 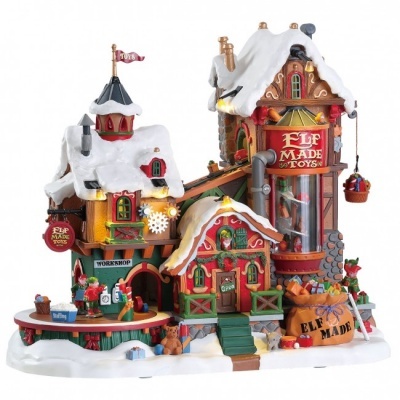 A mains powered illuminated and animated musical building suitable for placement in and amongst a seasonal Lemax village Christmas scene. A unique Lemax Santa's Wonderland Village collectable table piece which joined the Lemax collection in 2018 designed by a Lemax contest winner! Elf Made Toy Factory offers a delightful self standing polyresin (& plastic) building on an individual base to compliment your seasonal Lemax Christmas Village.